User has not posted a comment. User has not posted an ad. 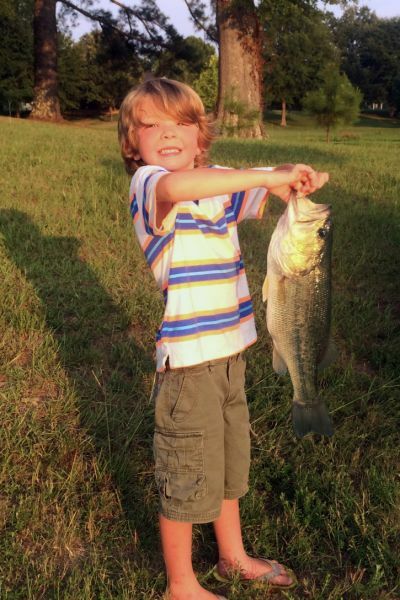 Cashe Dodson, 5 years old, caught this 6lb bass on a private lake in Prentiss County. Cashe was determined and fished all summer for a big bass. Two days before, while fishing, he was stung on the nose by a red wasp. The sting caused a severe allergic reaction that required him to spend the night hospitalized and miss his first day of kindergarten. All he wanted for a get well present was a new pole and tackle. The first thing he wanted to do after recovering was to put his hook back in the water. It paid off well! He will proudly tell you that he caught the bass on an orange Texas-rigged plastic worm. The fish put up a great fight for a several minutes. However, with total concentration and a bit tongue Cashe was able to wear him out! User has no comments at this time. User has no ads at this time. rdodson has not filled this section yet.